Brigid is now one of Ireland's patron saints, and is often linked in patronage to farmers and poor pastoral workers. On the place where she founded her first convent in Kildare stands the Kildare Cathedral - now Church of Ireland. Nearby is St. Brigid's Holy Well. "A holy well is very special. To watch water springing from the earth is to witness creation in the act of pure, unconditional generosity. At a holy well, my own interior holy well has an opportunity to make itself known to me." - Gay Barbizon, Brigid's Kildare; The Fire, the Well and the Oak. 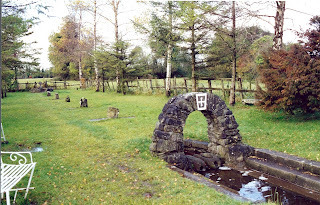 Pictured here is St. Brigid's Holy Well in Kildare. It is a public space with marked stations. At each station the pilgrim recites particular devotional prayers to St. Brigid.